Editor's note: We’re posting from sunny Orlando, where we’re chatting with schools at the annual FETC ed-tech conference. We wanted to share highlights from our keynote this morning, which featured a panel moderated by Tom Vander Ark, author of Getting Smart: How Digital Learning is Changing the World. You can watch a replay of the keynote on YouTube. If you’re in town, come visit us at our booth #1101 - we’d love to say hi! 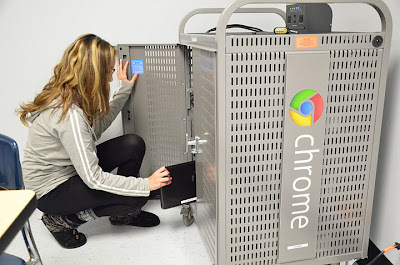 When we first conceived of Chromebooks, we were focused on providing a device that brought you to the web in the fastest, simplest and securest way possible. What we didn't realize at the time was that this device would be so welcome and popular in classrooms! Many schools are eager to improve access to the web and technology for students and are planning to provide each student with their own device – a concept known as "1-to-1" computing. We've heard from our customers that they choose Chromebooks for 1-to-1 because the simplicity of the web takes away the hassle for teachers, students and administrators. During our keynote at FETC this morning, we had the opportunity to share some exciting news: hundreds of schools in 41 states across the U.S. are using one or more classroom sets of Chromebooks today. As a highlight, three new school districts in Iowa, Illinois and South Carolina are going 1-to-1 – that is, one Chromebook each for nearly 27,000 students. It's great to see this positive momentum for Chromebooks in classrooms. It's similar to where we were about five years ago when Google Apps was just getting off the ground. At that time, educational institutions were the most interested and it was inspiring to hear the different ways schools and districts had begun using Gmail, Calendar and Docs. 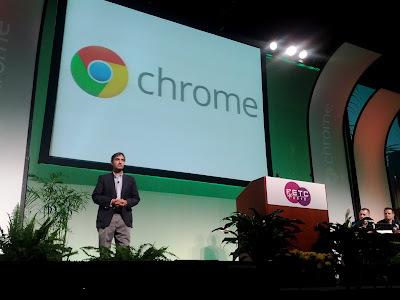 At FETC we’ve been similarly excited to see how teachers have formed communities around professional development for Chromebooks, districts all across the US are piloting Chromebooks in their classrooms, and more and more reach out to us to learn about Chromebooks for Education every day. We believe Chromebooks and the web have the ability to facilitate learning in a powerful way, and we’re committed to helping schools recognize their goals to go 1-to-1. But enough words from us. We’d like to close with thoughts from representatives of each of these school districts. Student at East Leyden high school selects a Chromebook from the charging cart. With Chromebooks, students can work on any device in any class period and access their work from anywhere - including from the Chrome browser installed on a home computer. 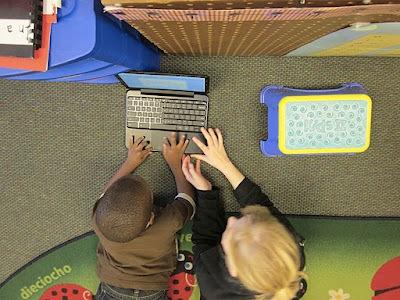 Fifth grade student teaches a younger student how to use a Chromebook in the Chrome Buddy project in Tim Swick's classroom at Pontiac Elementary School in Richland School District Two. Learn more about Chromebooks for Education on our website, and join us for the Chromebook Classroom webinar series, Wednesdays at 9AM PT/12PM ET. Curious to know if these run standard Chrome OS, of if they're running a special edition of the OS.